We ran a feature on the feasibility of solid state storage last month, and pretty much came to the conclusion that it was a good idea to boost the performance of your computer. Providing you had the money to throw at it. Now, though, it’s time to get down to it and give you some proper figures, not just opinions. So, the model I have is the Kingston SSDNow V+100, and according to the official Kingston website, it’s great for corporate environments, though I can’t see why, it seems to be coping quite well in my personal machine. With a capacity of just 96GB, you would be forgiven for letting out a quick snort before returning to your own PC, which boasts terabytes of traditional hard disks. But I would advise against it. Read on, because where solid state drives really come into their own is with raw speed, and it’s likely to make you think again before writing it off so quickly. So, with sequential read speeds climbing up to just shy of 200MB/s and write speeds similarly lofty at a maximum of 188MB/s, it isn’t difficult to imagine the benefits brought by solid state storage. 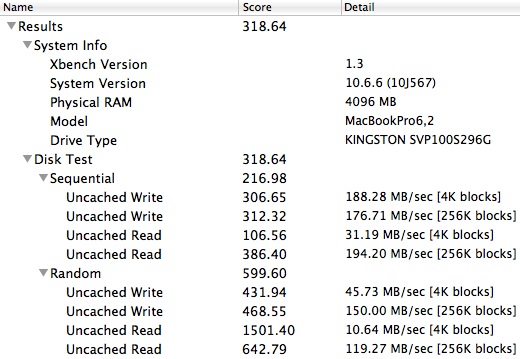 But, this is a specific test of a specific drive, not SSD’s as a whole, so let’s look at the Kingston SSDNow and how it stacks up against the competition. Well, rival products from Western Digital and Seagate have been reported to provide read speeds of up to 250MB/s which is obviously a good 25% more than what we’ve got here, but having said that those same drives fall short when it comes to write speeds, offering only 170MB/s. So obviously in normal usage this won’t make a noticeable difference, though you could say the same about cars, for example, you would rather have a car that did 0-60 in 5 seconds rather than one that did it in 7, right? Even though the difference isn’t exactly obvious to the untrained eye. With a pricetag somewhere around the £150 mark, depending on where you look to buy it from, it’s not the most expensive drive out there, but it’s also not the most spacious and that could cause a problem. Having said that, smaller drives are available in the range which would be more suitable to be used as a boot drive. This one seems too big to be used as just a boot drive, and a bit too small to be used as a hard drive replacement, it’s sort of in a middle ground that might not ultimately suit anybody. Having said that, I’m using it as a hard drive replacement in the laptop and have been for a while, plenty of time to fill it with junk at least, but with a bit of care and regular usage of ‘clean my mac’ to clear out the unnecessary files, it remains plenty capacious. In fact, on here I’ve got several downloaded games from Steam for Mac, my entire iTunes library, but compressed, which in lossless music format form amounts to well over 100GB. I came to the conclusion that due to the quality of laptop speakers, I didn’t exactly need lossless tracks. 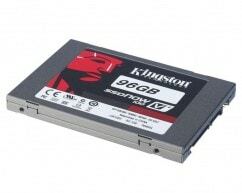 So the Kingston SSDNow V+100 is a great performing drive, a reasonable price from a hugely reputable manufacturer, if you read our reasons to buy a SSD as a boot drive last month and were tempted, I would definitely suggest this model. It might not appear to represent good value for money, but when you consider the speeds it gives and gives and gives, it’s well worth it and after a month or two of usage, I still find it phenomenal.